This is the Y Page of our A to Z guide to plants -- how to care for them, landscaping with them, and cooking and healing with them. 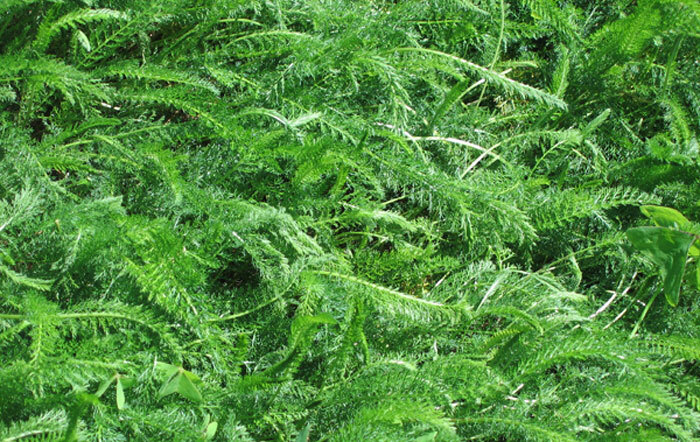 This is an appealing relatively low growing plant that for some time I believed to be some sort of feathery rather small fern. 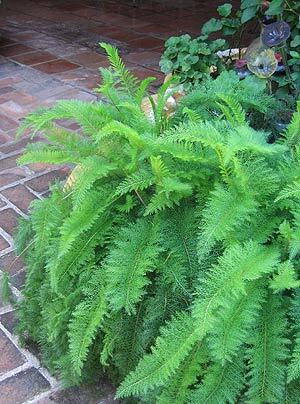 I loved having it in the garden and always seemed to be traveling when it bloomed so I never got to see that it wasn't a fern. 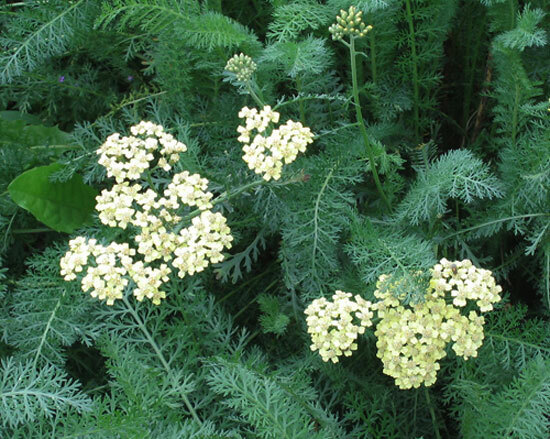 Benefits: Yarrow leaves and flowers have been used medicinally to relieve fever and in Europe it was sometimes used as a tobacco substitute. Apparently it also serves well as a "compost activator." Photographed: To the right at the Roger Williams Park Botanical Center in Rhode Island in 2013. 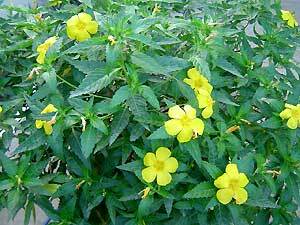 Planting and Care: This is a hardy plant in a warm climate and does well also in temperate climates. I found it able to handle a sunny place in the garden, but I suspect it will also do well in a semi-shady area. Give it routine rainfall or watering and it will do just fine. Photographed: On the left in our sunny deck garden at our former home in Montserrat in 2009 and on the right at the Hotel Atitlan on Lake Atitlan in Guatemala in 2010. This bush was one of the highpoints in our garden. 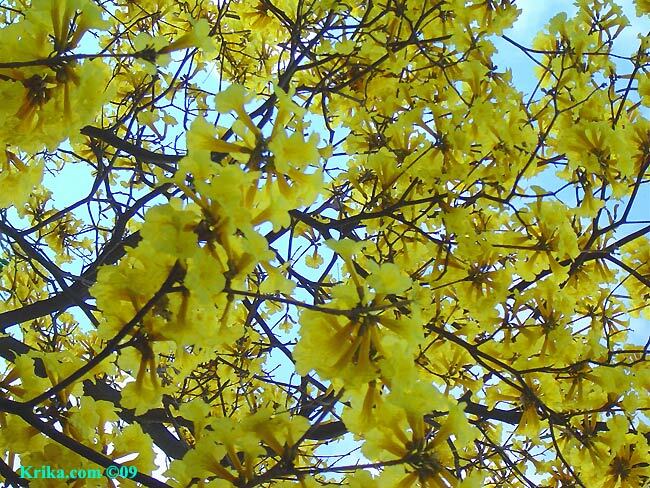 Every day of the year it is in bloom, covered with bright yellow flowers. It is beloved not only by us, but by all of the butterflies and hummingbirds that pass by. 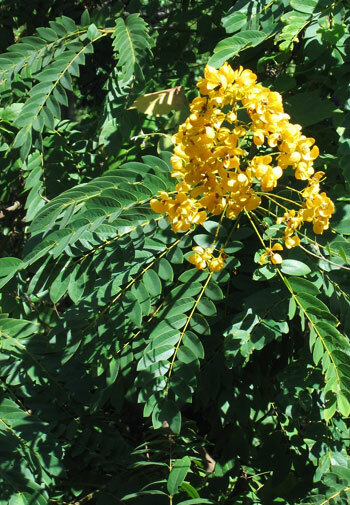 Benefits: This is considered and used as a medicinal plant in many areas of the Caribbean. Planting and Growth: Not only does this bush get high marks for being attractive, it is also one of the easiest to care for plants we had. It loves the sun and regular watering or rainfall, but will weather a dry spell just fine without help if it has to. Plant it in decent soil and give it some fertilizer when the mood strikes. You won't be disappointed. The Downside: Yellow alder is wonderful in all plant ways except one -- it smells bad if you brush by it. Plant it where that won't happen very often and you'll be as thrilled as I was to have it in your garden. Photographed: On the left along the stone stairway by the banana garden at our former home in Montserrat. On the right in our garden at Lake Atitlan in Guatemala. 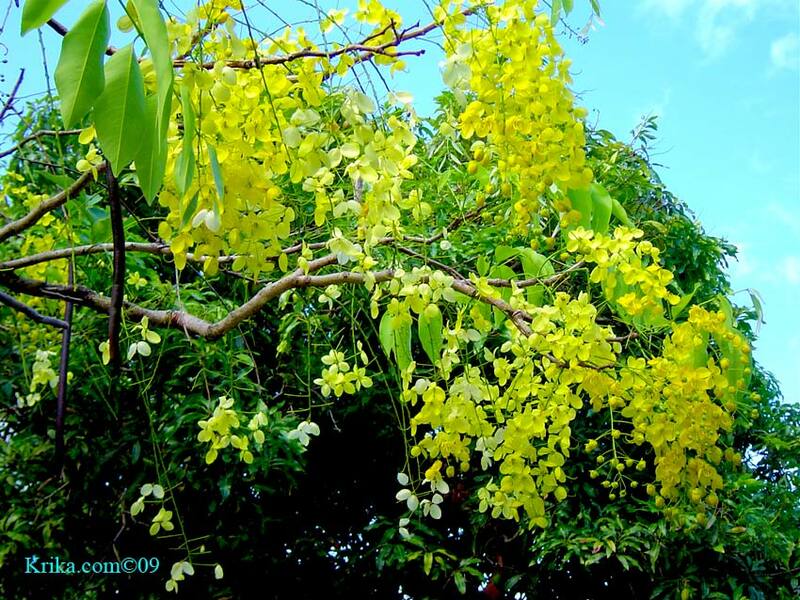 Benefits: This small tree (between 30 and 60 feet in height) has a truly glorious and very long lasting flowering period. 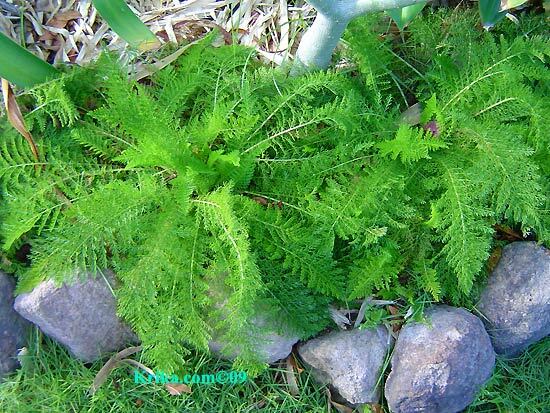 It's history includes its use as a medicinal plant though I haven't yet found what disorders it was used to treat. Photographed: On the left in Crown Point, Tobago, in May 2018. 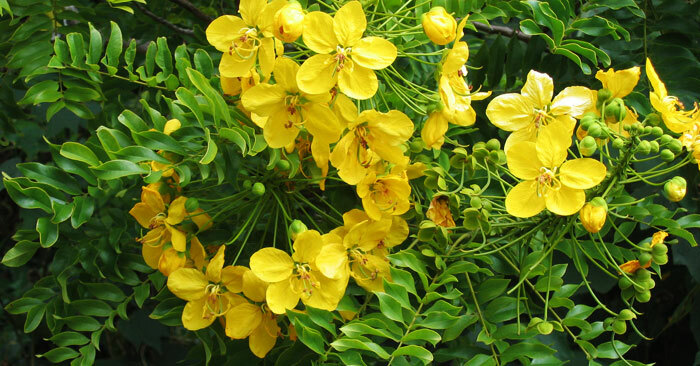 Planting and Care: Getting a yellow cassia tree growing is not hard once you forcefully extract the seeds from the rock hard pods the tree produces after flowering. Break one open however you can, soak the seeds overnight in water and then plant in good quality moist potting soil. When your little plants are ready, pick your site in full sun with any kind of well-drained soil with as close to a neutral pH as you can get. Keep your little tree moist, not wet, until it settles in and is off and running. 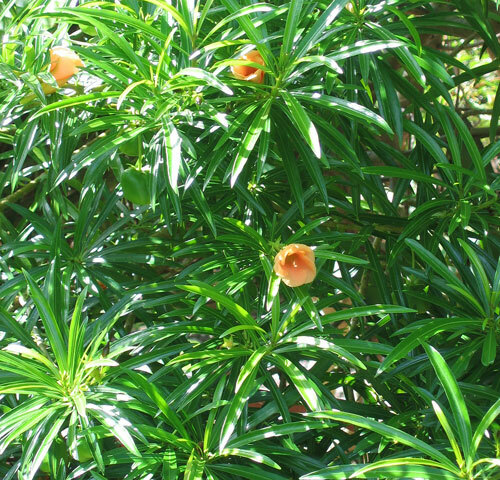 These are relatively small tropical trees whose foliage and long lasting flowers will delight you for years to come. 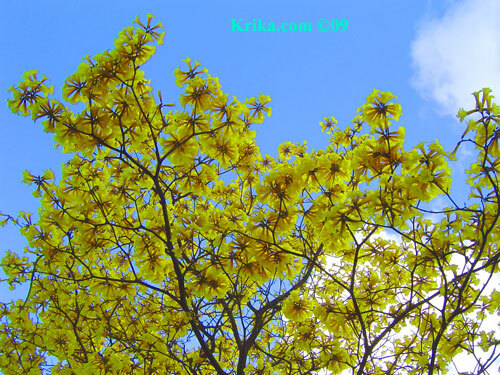 Make sure when you are collecting seeds to prepare for planting that you have found just the tree you want as there is some variability in their appearance. Warning: Do keep in mind that everything about this tree is toxic. 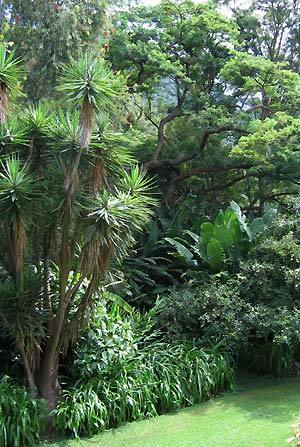 Photographed: To the right and left in the Carlos Thays Botanical Garden in Buenos Aires, Argentina, in 2010. 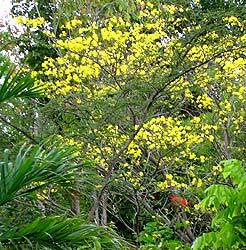 Photographed: By the side of the road in Woodlands, Montserrat, in 2009. Photographed: In the Auckland, New Zealand, Domain Park, 2013. 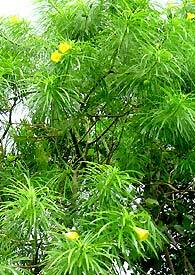 This is a very soft wood tree which without its fabulous huge brilliant yellow flowers would probably be considered a weed. I loved it. 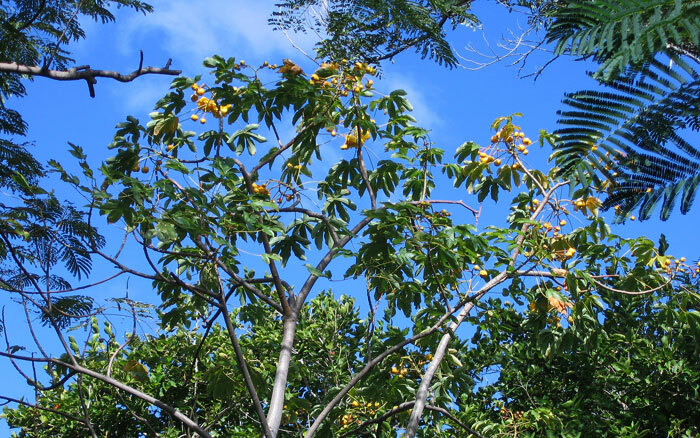 The tree branches willingly and grows to be only about 30 feet tall. When it blossoms all can be forgiven and truly forgotten. The many flowers are like bright yellow peonies. 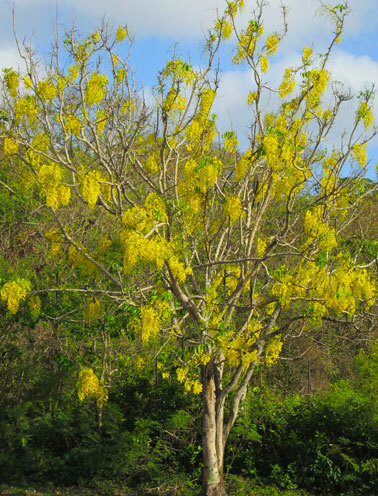 If you live in a warm climate this tree is a necessity! We had two, but our American neighbors killed one in a pretty careless construction project run by very sloppy Montserratian quasi architect Alford Dyett. 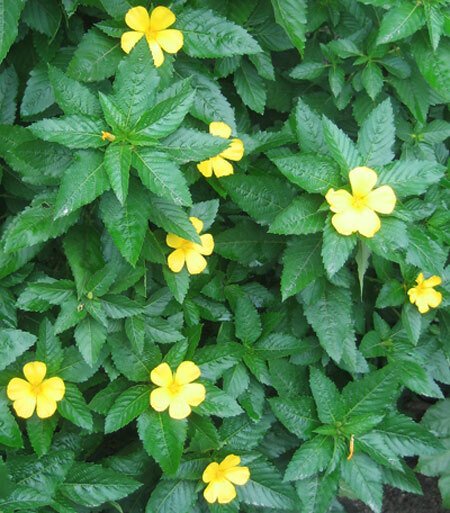 Benefits: It is used in traditional medicine in Brazil. Photographed: At the Latour Farm in Tobago in 2018 unless noted otherwise. Planting and Care: Like all weed trees this is flexible, some rain is good, more is better, less means fewer leaves. It likes bright sun and dirt of some kind for its roots. Easy, no? 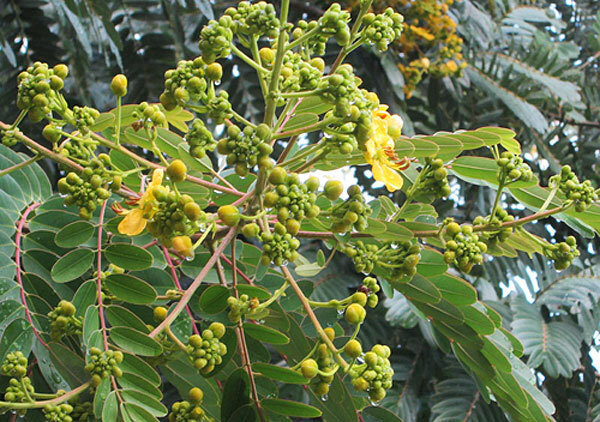 This small tree grows only to about twenty-five feet and has lovely yellow trumpet-shaped flowers in full bloom in December and January and continuing throughout the year with a more modest set of blossoms. It is a fragile tree with soft wood subject to Caribbean termites and it has what I call "bad hair days." These are times when the leaves seem to shrivel and turn brown as if the tree were diseased. It isn't. Within a few weeks all the leaves are green and lush again. 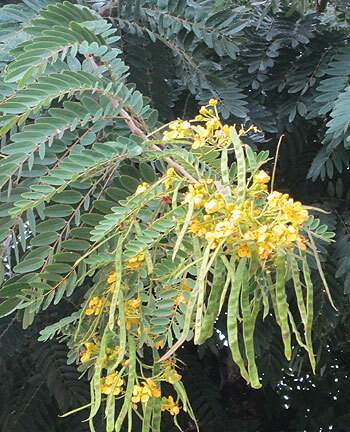 When we lived in Montserrat, our lucky neighbor across the street had a very unusual variety of this tree. Hers had lovely soft peach or apricot colored flowers. Apparently it also comes with white flowers, but I have never seen one of them. 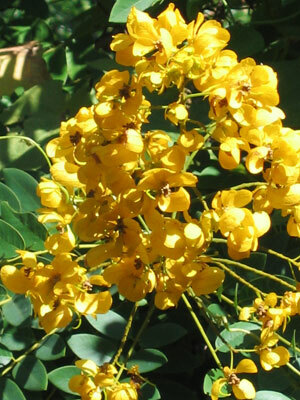 Planting and Care: Plant this soft, small, delicate tree in full sun or in a bright semi shady area of the garden. Give it a moderate amount of water until it settles in and then it should do just fine on its own. It appears to be very vulnerable to termites if it is damaged in any way (wind broken branches, etc.). Warning: This small tree is very poisonous. In the town of Taxco, Guerrero, in Mexico, these trees are called yoyote. For those who know of the American silver designer William Spratling, it might be fun for you to know he carried of of the seeds of the yayote with him at all times. He believed they would cure his hemorrhoids and he promoted the seeds to one and all. 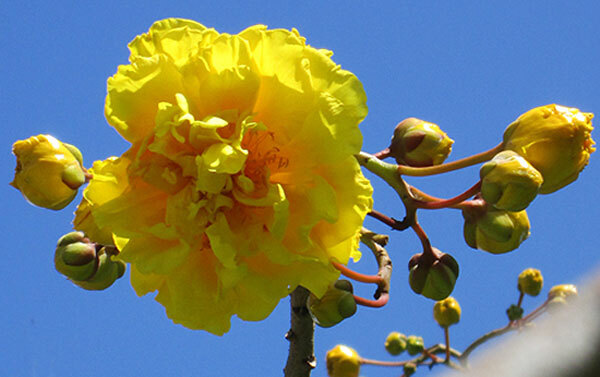 Photographed: To the left in our garden at our former home in Montserrat. 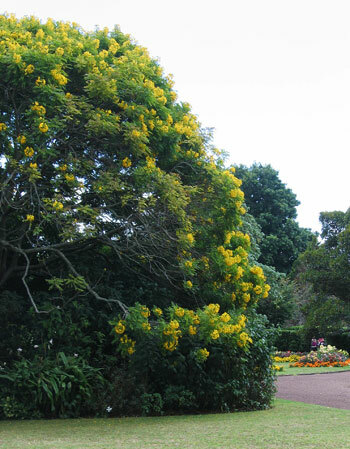 On the right with pale peach colored flowers in the Royal Botanic Garden in Sydney, Australia, in 2013. One cubic foot of wood from this tree can weigh 60 to 80 pounds and is known as Pao d’arco wood in Brazil and greenhart wood in Guyana. Just try to put a nail in it and you’ll find out how dense this wood is. 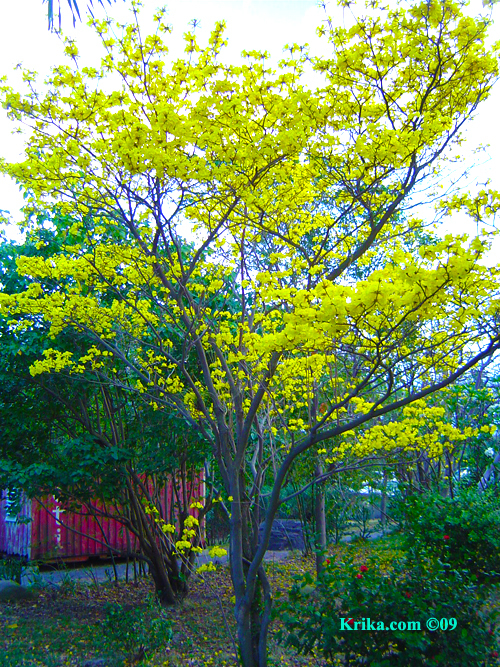 This tree loses its leaves, waits a few months and then is covered in bright yellow flowers for a few days, usually in late April. It is said to be very resistant to termites, though ours has not proved to be so. Ours are not there yet, but they will eventually grow to 70 or 80 feet. 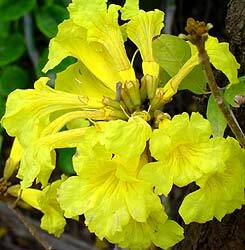 Benefits: Yellow Poui is the national flower of Venezuela. The wood of this tree is perfectly suited to a Caribbean environment being as it is resistant to sea water and termites. From: It originated in Mexico and in tropical climates all the way south to Argentina. 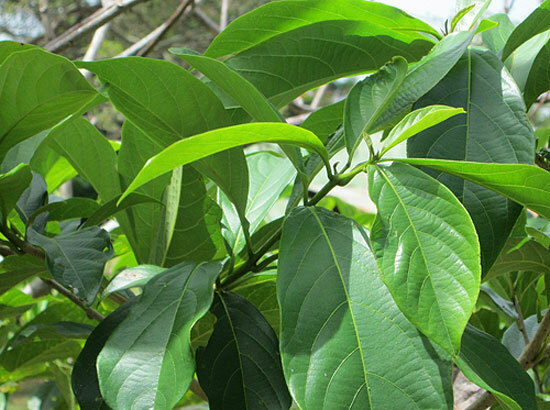 Planting and Care: Plant your poui tree in full sun in soil that is both moist and fertile with a pH of 5.5 to 8. Keep the soil moist, but not wet. 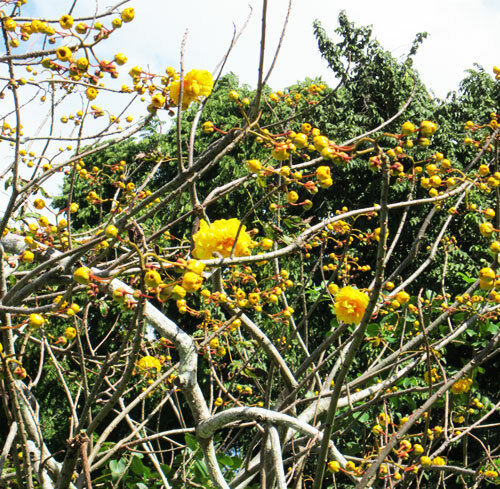 This is a very appealing shrub or small tree. 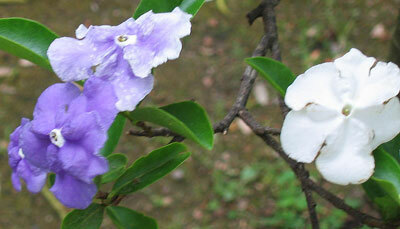 Its flowers open purple and then fade to pale lavender and eventually to white. It blooms all summer from spring straight into fall. Benefits: None found as of yet. Planting and Care: Plant it in bright semi shade or in a place where it will receive direct sunlight only in the early morning or late afternoon. It needs very regular watering and should never be allowed to dry out. Warning: All parts of this plant are toxic to humans and to animals. Photographed: To the left at at the Botanical Garden in Naples, Italy, in 2012. On the right in the Botanical Garden at the Hotel Atitlan on Lake Atitlan in Guatemala in July of 2010. Photographed: In a street garden in Malaga, Spain, in 2012. This is a yucca tree which will branch and grow to about thirty feet. It has lovely large branches of creamy white flowers, but, all in all, nothing sold me on this yucca aside from its planting and care requirements. Photographed: To the right and left at the Hotel San Buenaventura at Lake Atitlan in Guatemala, in 2008. Planting and Care: You will be hard pressed to find a more accommodating small tree. 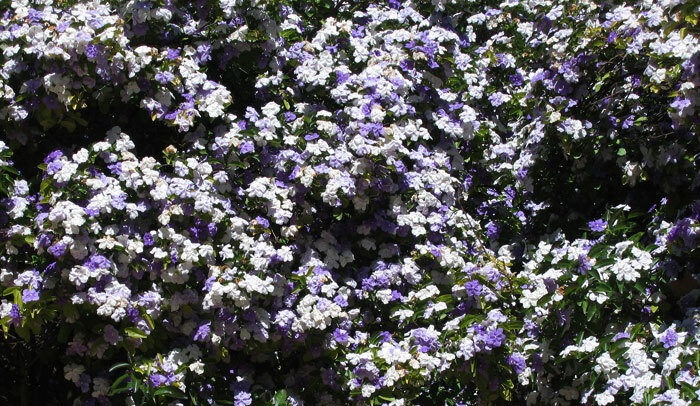 It will grow in full sun or full shade, it will grow in an acid or alkaline soil and it will survive droughts. 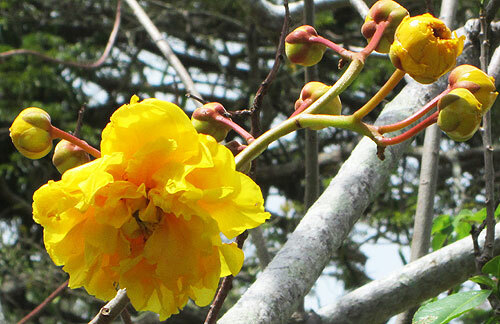 Perhaps its last great feature for those who find themselves without food in the Caribbean is that its flowers are edible! Of course as with all other plants it will do better with a bit of care, more water and a bit of fertilizer, but it is nice to know you've got a friend when you are just too busy elsewhere. Photographed: At the Hotel San Buenaventura on Lake Atitlan in Guatemala, in 2008. 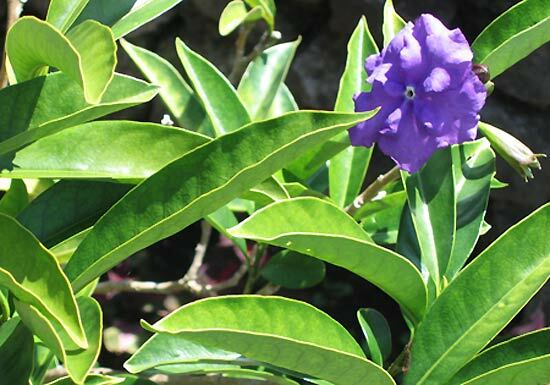 Photographed: At our former home in Montserrat where we began a property dividing hedge with these plants. Photographed: In the Royal Botanic Garden in Sydney, Australia, in 2012. This is a slow grower, but it can reach a height of over 40 feet if you have a lifetime to wait. Benefits: Yucca has been used for a wide range of ailments even used externally to stimulate hair growth and diminish dandruff. 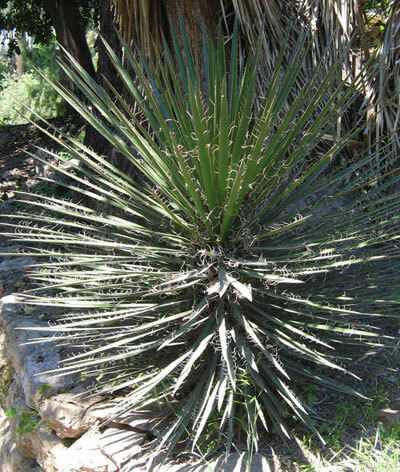 Planting and Care: As one would expect from its home base the tree yucca likes it dry and to live in full sun. It is not winter hardy. 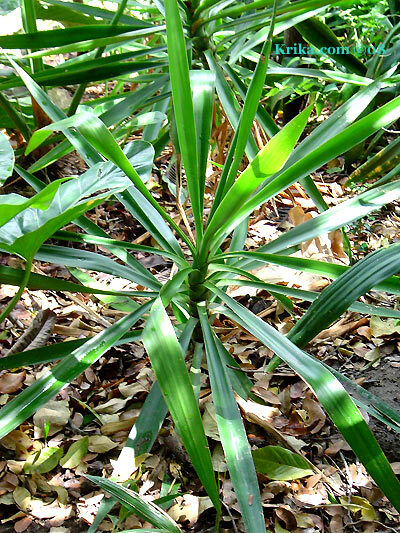 Benefits: Yucca aloifolia has been used as food and for its medicinal benefits. Care must be taken when using it for food as parts of the plant contain toxins poisonous for humans unless previously baked. Its toxins were also used in stunning fish which were of course then eaten. 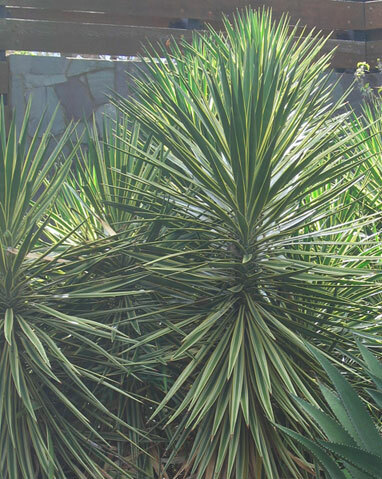 Planting and Care: This yucca is especially suited to warm climate sandy beach soils. It will grow to be almost 20 feet in height before falling over and growing again from the top now on the ground. 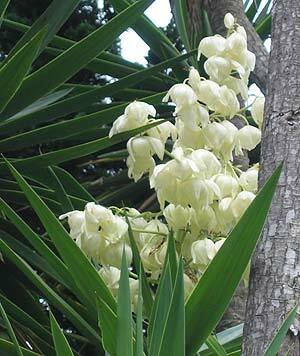 After a time it flowers with a similar appearance to other yuccas except that its flowers are tinged with purple. 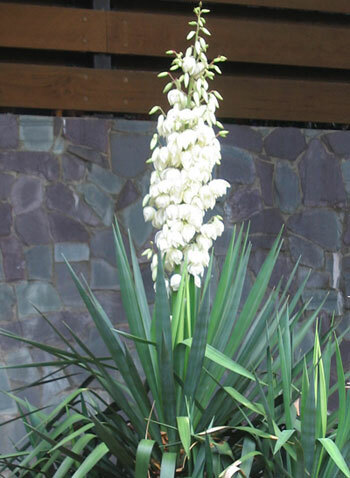 After flowering new shoots will appear from the base of the original plant creating a bit of a wall of yucca over time.